I am always on the lookout for local restaurants, delis, and other eateries. There is just something about going to a place that only has a single location. You start to feel like you are a part of something instead of just another dollar in the register, it is one of the reasons that I was so in love with Buster Burger (R.I.P.). With all that being said, I am proud to introduce you to Prime Sandwiches, located just west of I-15 and the 14600 South exit. Only open Mon-Fri between the hours of 10-3, it can be difficult to find the time to make it over, but if you happen to be in the area I suggest you drop in and give it a shot. My first trip in I decided to try their specialty sandwich. The Hemi is a 5 meat, 5 cheese behemoth, lucky for me one of the employees and a customer gave me a warning about the size of the full sandwich, I ordered the Half Hemi and was still unable to finish it. It was so big that I couldn’t eat it in normal bites, I had to just dive into it and hope for the best. The sandwich was great and as much fun as a lunch sandwich can be. The meat was fresh, the bread tasted great, and the bread tasted perfect. I think if I order the half Hemi again thought, I will ask for a little extra bread, by the end of the sandwich I had resorted to a knife and fork. I have been back a few times since my initial visit and each time tried a different sandwich, so far a hot Roast Beef and a hot Pastrami on Sourdough and I loved both of them. The menu at Prime Sandwiches is pretty basic but I am guessing they would be open to suggestions, otherwise you would pick the bread, condiments, veggies, cheese, and meat, get it as a half or a whole, hot or cold, and you are all set. The price isn’t crazy, generally (with the exception of the Hemi) under $5 for a half sandwich and under $10 for a whole. 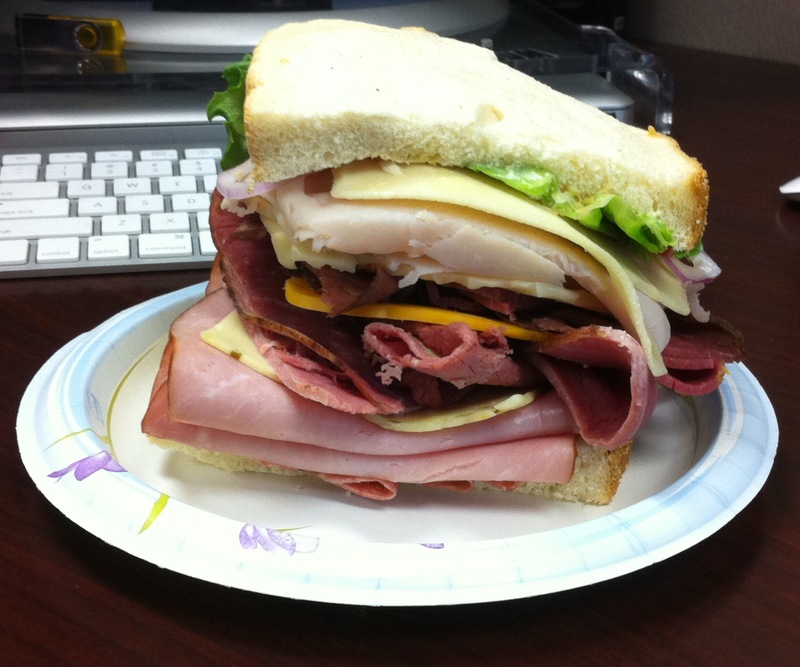 A half sandwich has 1/2 lb of meat, a whole has 3/4 lb, so the sandwiches are pretty decently sized. The staff is friendly and there doesn’t seem to be too many people so you can carry on a conversation and get to know more about the business. If I have any complaints about this place it would be how inconspicuous the restaurant is, but the more I think about that the more I like it. I would like to go back again and find out more about their business so that I can share it with my readers. Hopefully I will find the time to share a little bit of the history of Prime Sandwiches. They make a great Reuben!